Balancing equations is one of those iconic subjects that is synonymous with chemistry. Even if you have no idea what it means, you know that you’ll be balancing equations at some point during your chemical education. Before you can learn to balance an equation, you need to learn what the parts of an equation are and what they mean. After all, you can’t balance something if you don’t know what you’re looking at. The stuff on the left side of the equation (the 2 H₂ and O₂ part) consist of the reagents (also called the reactants). These are the things that you’re putting together in the reaction. The stuff on the right side of the equation (two water molecules) are the products of the reaction. This is what you’re left with when the reaction is done. The numbers in front of each formula are called coefficients. 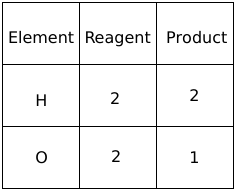 In the case of this reaction, where you have 2 in front of H₂ and H₂O, the “2”s mean that the reaction involves two molecules of H₂ and two molecules of H₂O. Since there’s no number in front of O₂, we assume that the coefficient is 1 and that there’s one molecule of it involved in this reaction. Now that you understand the terms we’ll be working with, let’s balance some equations! You didn’t think I’d let you off that easy, did you? Before we can balance equations, we need to learn why we do this in the first place. After all, you don’t need to do any balancing to know that if you react H₂ and O₂ with one another, you’ll end up with water. It sounds like we’re making life hard for ourselves. But we’re not. If you think back to earlier in your scientific learnings, you may recall something called the law of conservation of mass. For those of you who don’t remember this, what it means is that when you do something, anything, the weight of the stuff you make will be equal to the weight of the stuff you started with. This is why adding 100 grams of water to 100 grams of cereal gives you a bowl of cereal weighing 200 grams. This was the first Wikimedia image for “Conservation of Mass.” Insert your own joke here. It’s important to write equations in a form that follows the law of conservation of mass because it saves us time and hassle. For example, if you use an equation that is balanced to perform some reaction, you’ll have enough knowledge to understand how much stuff you’ll start with and how much stuff you’ll make. If you don’t have a balanced equation, you’ll just have to hope that everything comes out OK.
How barbecue grills were lit prior to the era of balanced equations. The way that we balance equations is to write coefficients in front of the chemical formulas in an equation. 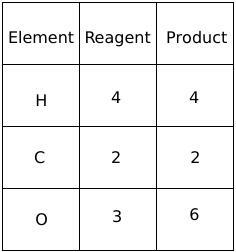 These coefficients multiply the number of atoms of each element in these formulas, so if you see a “2” in front of water, you’ll know you have four hydrogen atoms and two oxygen atoms. When both sides have the same number of atoms of each element, you’ve balanced the equation and written an equation according to the law of conservation of mass. An aside: Doesn’t the equation 2 H₂ + O₂ →2 H₂O violate the law of conservation of mass? After all, you’ve got three molecules on the left side of the equation (2 H₂ molecules and 1 O₂ molecule) and two molecules on the right (2 H₂O molecules). This doesn’t violate the law of conservation of mass. Remember, to conserve mass, everything needs to weigh the same on both sides of the equation, which means the number of atoms of each element has to be identical. Though there are three reagent molecules and two product molecules in this equation, the number of atoms of each element is the same. Essentially, the two molecules on the right are just bigger than the ones on the left. If you follow these steps, you’ll balance equations with ease. If you take shortcuts or ignore these rules, you may or may not have success. Since I’ll guess you like both success and easy things, why not just follow these steps? We’ll start with the equation for the formation of water that we’ve already seen. Yes, I know that we already know the answer, but I’m going over it again so we know how to get this answer. Seriously, just go with me on this one. Step 1: Make an inventory of the atoms in this unbalanced equation. To use this chart, just figure out how many atoms of each element are on the reagent and product sides of this reaction. 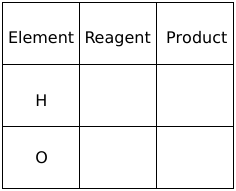 In our case, H₂ indicates two atoms of hydrogen and O₂ indicates two atoms of oxygen on the reagent side of the reaction. H₂O indicates two atoms of hydrogen and one atom of oxygen on the product side. Let’s fill out the chart. Step 2: Figure out what coefficient should be changed. Now that we’ve added a “2” before “H₂O”, we need to change our inventories for H and O on the product side of the equation. If both columns match up, the equation is balanced and we can rejoice. If not, then we need to keep balancing until we’re finished. Though the oxygen atoms are now equal, the hydrogen atoms have become unbalanced. This is not unusual when balancing equations, so if inventories seem to get a little screwed up from time to time, don’t panic. Because the reagent and product inventories aren’t the same, we need to go back to step 2 and change another coefficient. Step 3 (again): Redo the inventory with the revised equation. Because the columns are the same, the equation is now totally balanced. Which, if you had looked at the example at the top, you knew already. On the other hand, if the equation was not balanced, the right thing to do would be to go back to step 2 and continue the process until you get the right answer. 1. Do not EVER change the formulas of any of the chemical compounds! In the example we did, the urge is strong for people to simply change H₂O to H₂O₂ to make the equation balance. Though this will, indeed, make the equation balance, the balanced equation won’t be for the chemical reaction you were interested in. For example, H₂ + O₂ → H₂O₂ is a balanced and valid equation, but it’s for the synthesis of hydrogen peroxide and not water. Nice, but irrelevant. No matter what you do, imagine that there’s a box drawn around each formula and that you can’t change anything inside of it. You’ll sometimes find that the two columns you’re working with never balance. The most common reason for this is that you’ve made a mistake in your inventory someplace and the error makes the equation unbalanceable. If this happens to you, starting over is the best thing to do. 3. Always do the inventory for every single step! There will come a time when you will be able to visualize the answers and skip this whole method. This time has not come yet, so when you work on these problems, make sure that you actually write down each inventory instead of trying to keep it all in your brain. There are too many numbers to keep track of, and it takes practice to get it right. We chemists have a saying “If you don’t write it down, it didn’t happen”, and in this case, it’s true. This girl was originally a boring loser. However, once she started doing equation balancing inventories, she became the sort of wacky person who points a pencil at people. Which is… good? When balancing an equation, you may be thinking that you can put several coefficients into the equation at once to figure out the answer. Maybe this is true, and maybe not. However, I know from my own teaching experience that students are much more likely to get things wrong if they try this, because they quickly confuse themselves with all the numbers in the equation. Take it step-by-step, and only put in more than one coefficient at a time if you have no other options. 5. If the equation simply won’t balance, just write a “2” in front of the most complicated-looking formula and start over. and take the process from there. I won’t go through all the steps, but doing so will lead to the answer 2 C₂H₄O + 5 O₂ →2 CO₂ + 4 H₂O. Not a beautiful answer, but the correct one. 6. If you can reduce the coefficients, do it. It balances, right? I mean, the numbers in the inventory are all doubled, but they still equal each other. Case closed! There is one caution, though – you can only reduce things when all of the coefficients can be reduced. For example, with our favorite water equation, you can easily see that the 2 in front of hydrogen and 2 in front of water can both be divided by 2 to give 1s instead. However, since oxygen can’t reduce by 2, we can’t do this. I just made 450,000 cookies and I approve of this message. 7. If you still can’t balance the equation, give up (for a few minutes). Yep, give up and move on. For a few minutes. Chances are good that if you’ve been working on a single equation for ten minutes you’ll be burned out and making the same mistakes over and over again. If you wait a few minutes before returning, you’ll forget the mistakes that you’ve made and have a better chance of finding the answer. It is, however, possible to wait too long before finishing the problem. Sample problems: You can practice the equation balancing process by using the worksheets I posted over HERE. Cubes with water and stuff: By Tahmar1900 (Own work) [CC0], via Wikimedia Commons. 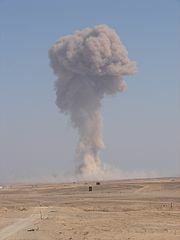 Blown up grill: By Mark Pickens, USASMDC/ARSTRAT (United States Army) [Public domain], via Wikimedia Commons. 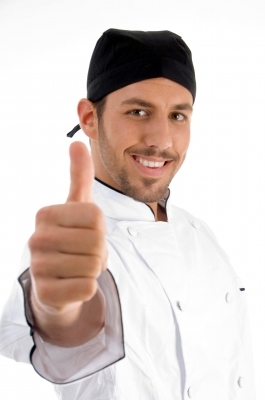 Thumbs-up guy: Image courtesy of imagerymagestic at FreeDigitalPhotos.net. 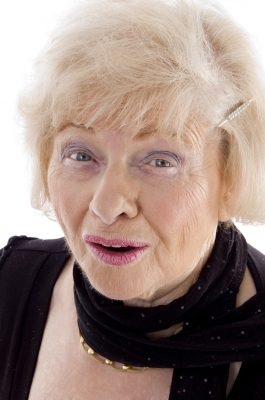 Older woman: Image courtesy of imagerymagestic at FreeDigitalPhotos.net.